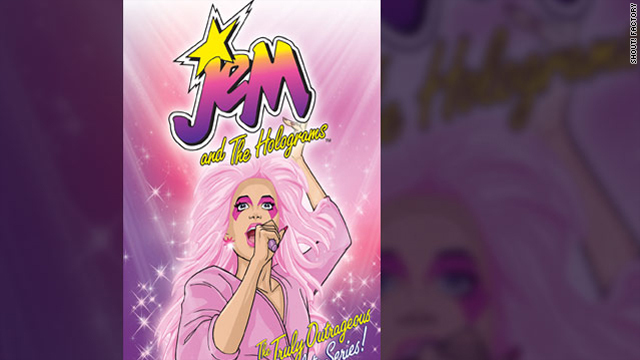 If "Jem" reruns on the Hub network aren't enough "glamour and glitter, fashion and fame" for you, next week you’ll be able to own all 65 episodes (and oodles of extras) in a "truly, truly, truly outrageous" 11-DVD box set from SHOUT! Factory. The animated '80s rock star and pop culture icon can be seen in all her pink-haired, star-shaped earrings-wearing glory. Fans will be able to enjoy bonus features like archival footage, commercials for the original "Jem" toy line, the series "bible," and new interviews with the series cast, creators and animators. For example: Did you know that the storyline that became "Jem" originally centered on a boy band whose members had secret identities and were superheroes on the side? Or that Jem went through a series of name changes, including Em, Misty and Morgan? Hasbro was seeking out a Barbie-esque doll at the time with a modern edge. The toymaker wanted a wild child Barbie with an attitude to rock 'n roll onto store shelves. (And apparently broader shoulders and much bigger feet - a major customer complaint was that Jem and Barbie couldn’t borrow from one another's closets.) 'Tis no coincidence that "Barbie and the Rockers" emerged on the scene two years after "Jem." Hasbro came up with the idea for the dolls first, then set about creating a television series. Yes, the show was essentially a half-hour commercial, but "Jem" Head Story Editor Christy Marx developed the characters far beyond the personalities printed on the toys' packaging. "I was told that there was a toy line but I never saw them," Marx told SHOUT! Factory, saying that she developed the characters without any visual guide. Marx used the basic setup of the "Jem" saga to create characters like villain Eric Raymond, the foster girls and places like Starlight House and Starlight Music. Marx even invented Rio's Lois Lane dilemma: The purple-haired boyfriend of both Jem and Jerrica had no idea that the girlfriends he was two-timing were one in the same. The concept spearheaded by Marx was carried throughout "Jem's" 65 episodes. Story Editor Roger Slifer told SHOUT! Factory that "Jem's" animation team didn't approach the series like a typical cartoon. As with "G.I. Joe," which was inspired by James Bond, the animators took their cue from live-action, allowing the series to take on a soap operatic, character-driven tone complete with dramatic cliffhangers, earthquakes, explosions, chase sequences, rickety bridge accidents and runaway trains. Had the show been live action, such scenarios would have commanded a "truly outrageous" budget. And let's not forget the music videos weaved throughout each episode. For a children's cartoon, "Jem" tackled sensitive issues such as homelessness, loss of a parent and teen runaways – the series even ran a help number for runaways, and the hotline received many calls as a result. Marx stated that through it all, she never veered away from telling good stories and never talked down to viewers, saying that "Jem" is about "the human heart and the human spirit. When you strip away everything else and just get down to the character relationships, it's about people caring about one another, helping one another, being true to one another, doing the right thing." I loved the cartoon as a child! I even won the Jem singing contest where you called in and sang the theme song. Maybe I'll get this for my daughter. I'm glad the cartoon is back out there.